I have been creating artworks for most of my life. 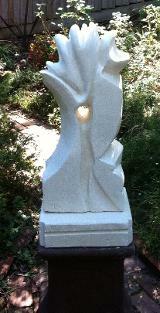 I ventured into tapestry weaving, pottery, painting, mosaics and now, limestone sculpture. I love the texture of limestone, often containing fossils and quartz crystals. It also ages beautifully outside to a soft grey. Limestone statues are suitable for inside and especially, outside, enhancing gardens. 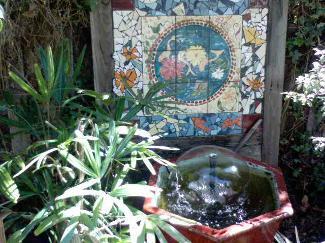 The mosaic tile panel opposite is of hand painted fish with commercial tiles made into a mosaic boarder. It frames a fountain.